Fancy getting a pair of FREE tickets to see Manu Chao perform at the Royal Hospital Kilmainham on June 27th plus an official Great Outdoors Summer Gig Survival Kit™? We are giving 1 lucky winner just that with thanks to MCD. 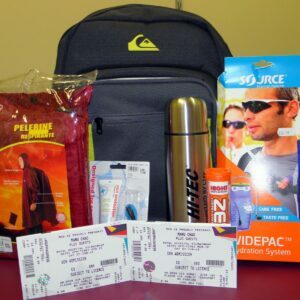 The Great Outdoors Summer Gig Survival Kit contains all the necessary items needed to attend a summertime gig in Ireland including a poncho, some sun cream, a Hi-Tec flask for hot drinks, aSource hydration kit for cold drinks, Some High 5 Electrolytes for extra energy plus a QuiksilverSchoolie backpack with freezer pocket to keep everything contained and on your back. So what mountain do you have to climb to win this prize? None! Click here to go to the entry page and tell us your details plus Manu Chao’s date of birth (as verified by wikipedia) to be in with a chance of winning. The winner will be announced through social media and other channels. The following are the terms and conditions of the Manu Chao Ticket Giveaway. Your participation in the competition shall be deemed to be your complete acceptance of the terms and conditions herein. •Entrants can enter as often as they like but in the end, there’s only one prize. •Winners will be notified via email and prizes must be collected in-store before the concert takes place on June 27th or else the prize will be forfeit. •The winners’ name will be disclosed to anyone who writes to the Great Outdoors at their physical addresses.